Last week, Royal Mail released a set of stamps commemorating the contribution of ten Royal Society Fellows to the scientific world. Among these eminent scientists is the surgeon and pioneer of antisepsis, Joseph Lister, whose portrait was licensed from Wellcome Images to feature on the Special Stamps. Before Lister’s introduction of antisepsis into clinical surgery in 1867, the mortality rate from postoperative infection was around 50 per cent. While a surgical procedure was often deemed ‘successful’, the same could not be said of the patient’s return to health. Inspired by the newly born germ theory, Lister made a connection between the fermentation process described by Louis Pasteur and the formation of pus in surgical wounds. Pasteur suggested that the exposure of the responsible microorganisms to a chemical solution would destroy them, which led Lister to discover that swabbing wounds with carbolic acid reduced the incidence of gangrene. 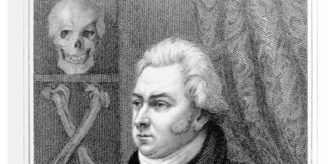 Adoption of Lister’s techniques caused mortality from amputation to drop from 45 to 15 per cent . The rise of antiseptic surgery made possible the development of surgical techniques that have enabled the success of a wide range of procedures today. 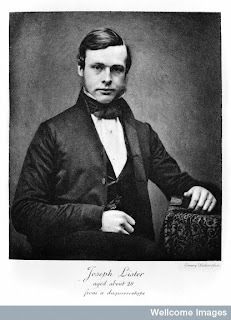 Wellcome Images holds a comprehensive collection of clinical photographs, accessible to healthcare professionals and for use in healthcare education, some of which show the results of operations that would not have been possible without Joseph Lister’s contribution to medical science. 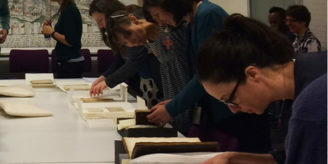 The Wellcome Library has an extensive range of material on Lister’s life and achievements, including a collection of manuscripts, which recently inspired ‘Exploring the Invisible’, a Wellcome Trust-funded project, which culminated in a live installation at the Old Operating Theatre, and which we discussed in depth in previous posts. (For more on the Royal Society stamps, there’s an accompanying photo gallery on the Royal Society’s website and an audio slideshow on the series on the BBC’s website).